The lambs grow very fast. They will soon be as big as their mothers. They are not quite eight weeks old, but man are they getting big. 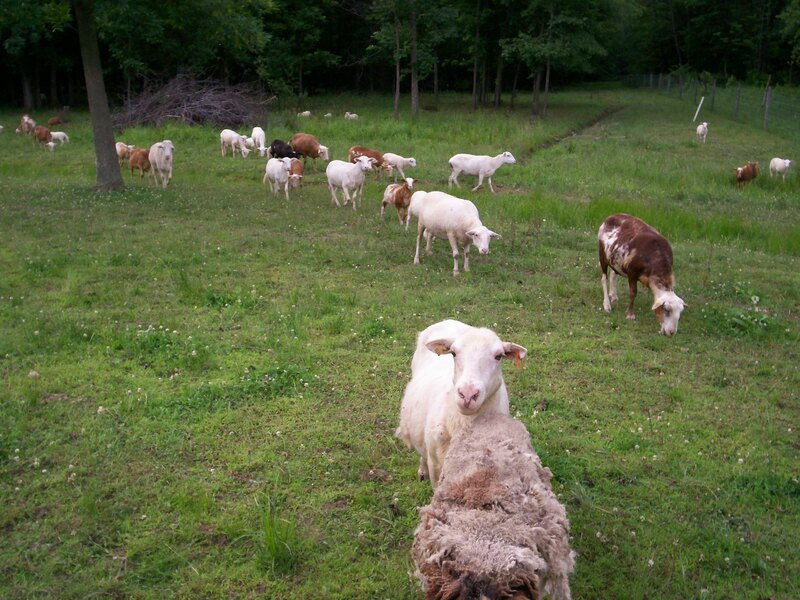 In this picture, we are about to move them to another pasture. This wooded pasture was once a dense, useless brush patch. These sheep and other livestock, along with cutting out the junk trees and brush, will soon make this a very nice quiet lea. I plant white clover every spring here and it is starting to flourish … I think the pasture and mom’s milk make the babies grow like mad. My oldest son and his family were here today helping to get all the hay tools ready for tomorrows hay day. A big portion will be gathered in and we want everything as ready as it can be. My son did some stuff that I used to do and his children did some things that he used to do… I stand back and watch them grow …. just like the lambs. I get the pleasure of being the wise one. I guess because I have lived long enough to have learned a few things. I pass on that wisdom along with some “wise cracks” … just to keep everybody entertained. I think it helps all of them to grow..or at least mature so they know to respect their elders…. Even if we do sound a bit weird now and then. I guess these days I am a haymaker. I have several acres drying in the sun. Unlike the knockout punch I reference, this job is mostly painless. The hardest part is waiting, watching the sky for rain, worrying if it will get dry, then scrambling to get it all baled and into the barn. This job requires help. It can be a fun job if you make it that way. I like when the family comes to help. They all tease me about dang near everything I do. It is all good-natured teasing and inspired by the master teaser … me 😮 I have been known to poke fun quite often …usually every time I open my mouth. I think I got my teasing and joke telling genes from my dad. His corny jokes and smiling eyes live on in my memory. I don’t remember him ever having a cross word for anybody. I am not that easy-going, because I have used cross words and even a haymaker or too in my younger days. Although now I see that my dad had it right all along. One of the greatest feelings each year, is when the last bale goes up the elevator into the barn. The round bales too are all done and put away and the hay making season is complete. I like to have a picnic celebration with as many family members as can come. It truly is a great feeling knowing that the job is done and the winters feed is stored away. The horses help with haying. They rake much of it and this year will even pull the baler. My new power cart will get a workout as its engine supplies the PTO power to run the baler. This makes it all worth it to me. Farming to me is fun and haying with horses just makes it even better. The horses and my ways of doing things are sometimes a great source for my children’s teasing. They poke at me for being slow and old-fashioned, but the cameras flash away and cell phones click as pictures are stored to mark the fun we have. … or perhaps it is to document that I actually do work. This year will be the first hay season since the new “slow down plan” has been put into place. I have half of the hay down and drying with just two fields to go. We will make fifty-five acres less than the last several years. I can’t say that I am disappointed either. The help, I am sure, won’t be disappointed. I have been making hay on this farm for nineteen seasons. I have gone through kids, grandkids and neighbor kids. I have sorted out what works to motivate them all. Mostly the kids want purpose and like to be praised. They learn teamwork, hard work and fun work. They make memories to last a life time and they learn many corny jokes…and every now and then, perhaps a new cuss word, when the baler doesn’t want to tie the string. If the corn gets frosted by an early frost this fall or even if it just doesn’t ripen, hogs will eat “soft corn”. The crop will be saved. 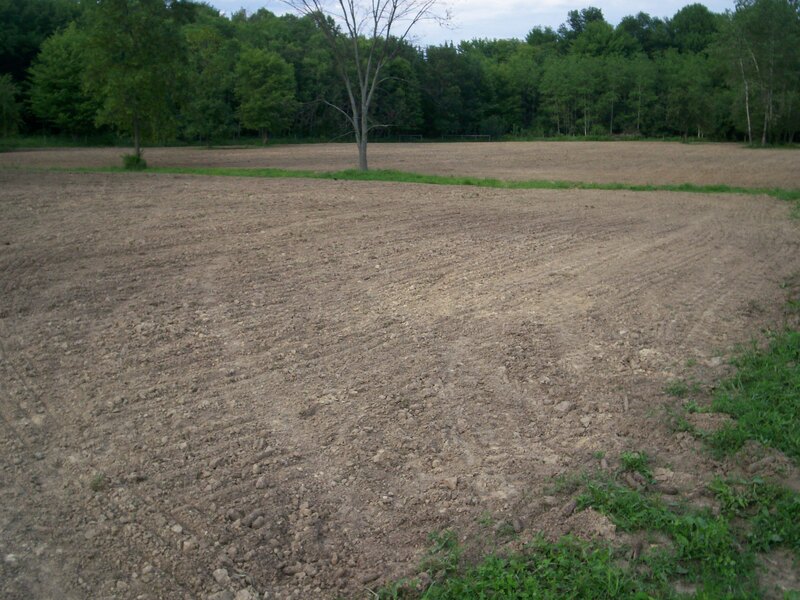 My hard work and seed money will not have been lost … so all is well here on the farm. The hay did not get wet and it looks like the last of the clouds will pass without dumping on us. Cutting the hay, and taking that chance so far has worked out. It cured all day yesterday and boy does it smell good. Today I will cut much more hay down. The 2011 haying season is in full swing. My neighbors are scrambling to make hay too. This spring and early summer has been a challenge, but that is farming. Today will be a day for reflection. 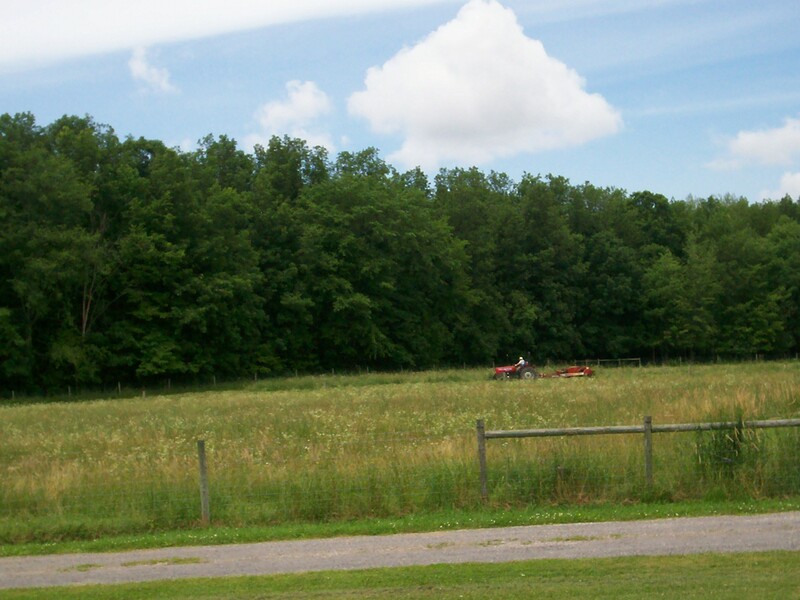 The tractor will make round after round as I mow the fields of hay. I will be ever watchful of the job, but can send my mind on vacation. I can make plans, sort out problems and think about people and things that I have known. This process is heightened in the next day or two when the horses and I rake the hay. They are much quieter than the tractor and thoughts come easier. Have a great day people. I must go “make hay while the sun shines”. Know for sure that I am in my thoughts and in my glory …does it get any better than that? ….. I don’t think so! 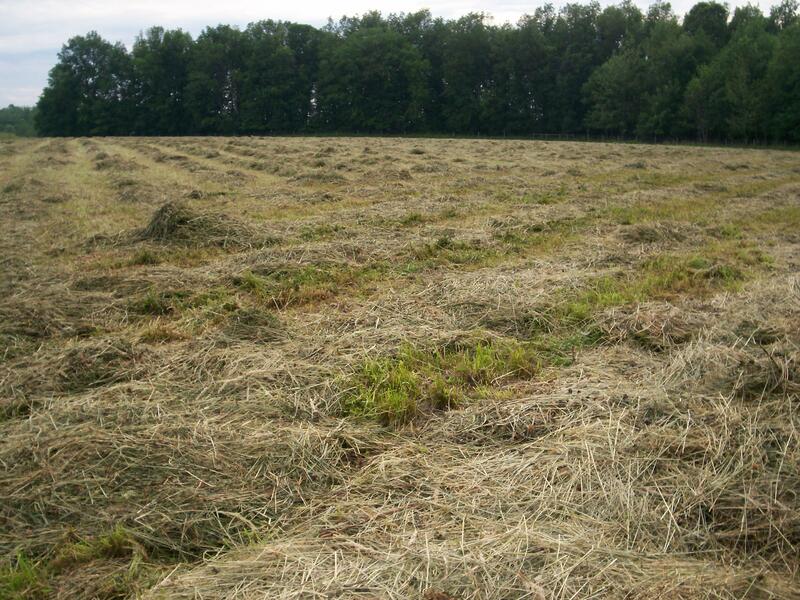 Yesterday, I took a chance and cut the first of this year’s hay. They say there is a chance of rain overnight tonight, but I am taking that chance. The wind is out of the north, so hopefully it will push the rain just a little south of us. If the hay gets rinsed off, it’s no big deal, it will eventually dry and the cows and sheep will eat it. This field is new seeding planted last spring. There is an abundance of clover in it. The clover is thick and rank. Most of it is over thirty inches tall. It plugged the haybine often, making for a very slow job. I will cut more Tuesday in a field that hopefully will make nice “horse” hay. The horses get timothy and it must be cured correctly to avoid any dust forming in the drying hay. In my youth I took chances, like passing cars when I really couldn’t see all the way around. I sped off to work and then home again, sometimes making a three-hour trip in only two and a half . I stayed up too late , hoping that the next days workload would be light and drank beer before I was old enough. The chances I just mentioned were tempered by things like taking a chance on a new friend or meeting a girl and seeing what my chances were 😮 Now that I am older, I don’t speed much. I have a picture of my grandchildren taped to my dashboard, to help me remember the risks of bad driving. I guess most of my chance taking revolves around this farm. Today I will plant field corn for the animals. Today is twelve days past the last day for planting corn according to the experts, but I going to take a chance. The seed is paid for, the field is finally ready and something here will eat it, no matter how it grows. I like giving people a chance too. I have met some that didn’t work out worth a darn, but there have been others that are better off for my believing in them. I start everyone off on a level playing field, the rest is up to them. If they work hard, tell the truth and be genuine, then I continue to take a chance on them. The ones that don’t measure up, don’t get too many chances before I give up on them. Then its up to them to win me back or not. I have taken a chance or two on a few horses. Some of them worked out pretty good. A few I couldn’t wait to close the trailer door on their way out of here! I guess that is the way life is..take a chance, be ready to give someone a leg up, but…… keep your hand on the trailer door just in case! Our daisies are just about to bust open with blooms. It is like April here with rain still an almost daily event. The last few days we have gotten about 2 inches again. All field and garden work has stopped. The hay waits for cutting and drying in the elusive sun. 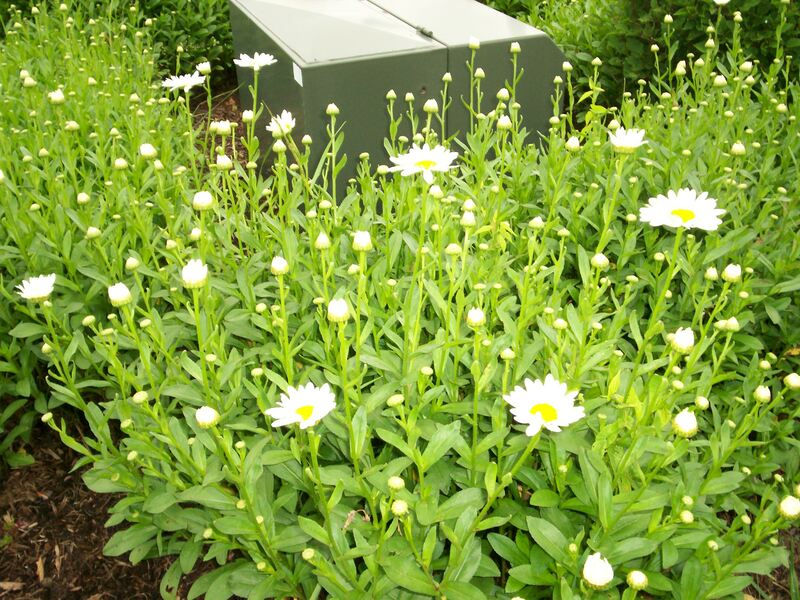 We started out with a small clump of daisies given to us by my grandma’s sister. My aunt has had these flowers since she and her husband were first married over sixty years ago…. not the same ones of course, but kin to them for sure. I have moved these plants from here to there and all around our farm. They need split again. I will be giving some to my children for them to enjoy and propagate. My aunt would be happy about that. Moving these flowers is a very a simple thing. The clumps are split and then moved to a new spot. The original spot still grows some, but the split clump starts to colonize a new area very quickly. It makes itself at home and very soon beautifies the area where it grows. We have transplanted kids and grandkids, splitting off from our family and establishing themselves in new areas. Each one, in his or her own way, beautifies their neighborhood. Some do it with buildings and style, some with landscape and flowers, but all of them, with themselves. It is not where you grow or where you are transplanted that makes a difference. It is how you approach life from where you are. Dig deep, be the person you are and stand for what is good. Then, just like the daisies, you will beautify all that surrounds you. Folks will know you come from a good start and you will build confidence in yourself. There is a sense of pride, knowing where you came from, even if you have been transplanted. Just like the flowers who can trace their roots back many years, to many places and by way of many folks , the twists and turns in life are all what we make them. You have a choice … make the choice to be happy. 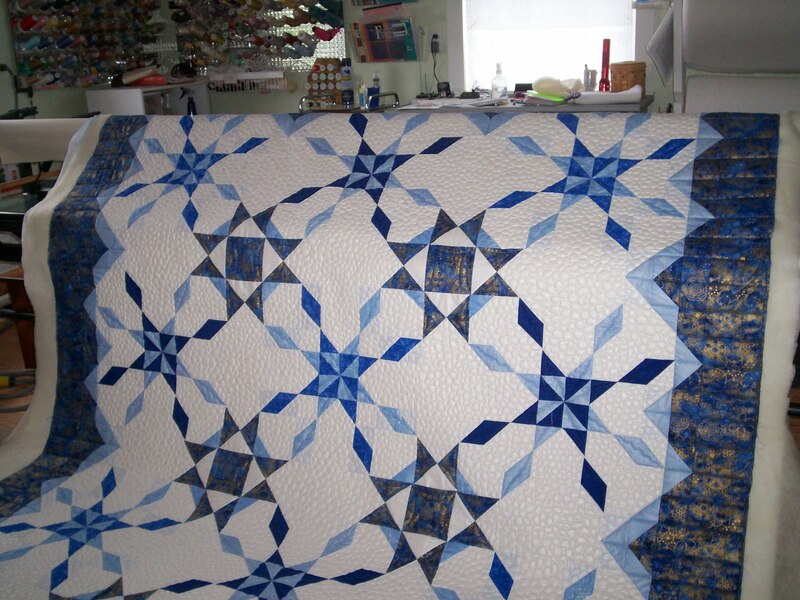 Connie made this quilt. She titled it “Winter Blooms Are Snow and Ice”. It was a prize winner. She made it last summer during the hot days, but thought about the warmth it would provide on a cold winter night. I guess quilting is much like gardening or farming. You have to look into the future to see a full freezer or pantry while pulling weeds. Those vegetables taste so good long after summer is gone and the hard work is long forgotten. It is hard sometimes to keep it all in perspective, but well worth the effort. I am reminded about the story of the grasshopper and the ant. The ant labored all summer in the heat and humidity, while the grasshopper goofed off idling away the hours. The winter came, the ant was well prepared to survive, but the grasshopper died a slow painful death from starvation. My grandparents used this parable often to reenforce working when I really didn’t want to do it. As I write these few lines, my wife is once again, turning pieces of cloth into a work of art. She is meticulous when it comes to colors, seams and thread. I barely notice the “glaring errors” she points out. I can see a crooked furrow, a cull tree or a sick animal as plain as day, but when looking at the quilts, I can only see beauty. My mom and grandmas made quilts when I was a boy. They made them from scraps of cloth and old, worn out clothing. Then they tied them together with yarn. These patchwork quilts kept us all warm. They even warmed your heart as you saw a piece of your grandma’s old dress or apron and felt the love in every stitch. Under a thick pile we would sleep in our cool upstairs, snug as bugs in a rug, as they say. I still sleep under a quilt or two. I enjoy the sleep that hard work gives a man. I still get the warmth in my heart from the love in every stitch… some things just don’t change. Thank God! This little stool belonged to my mother’s grandpa. He milked cows on a little farm near Andover Ohio. 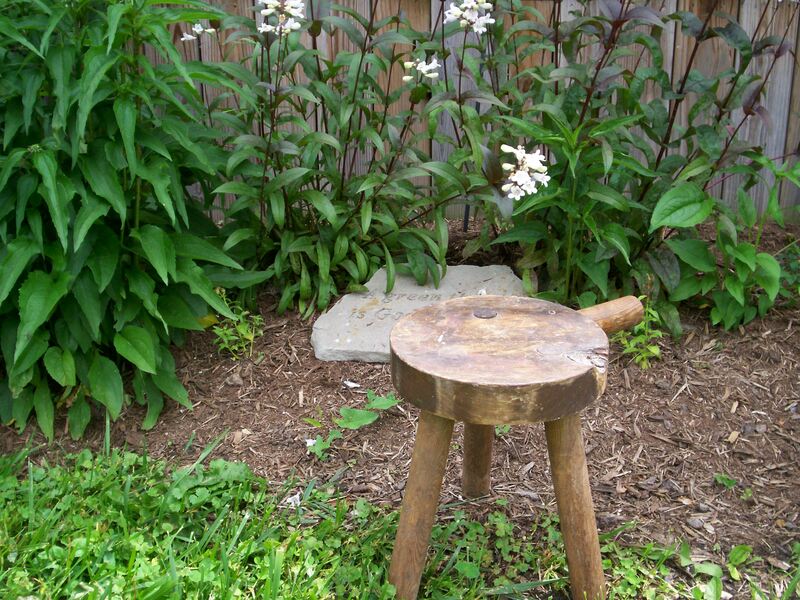 This stool was made by him and is one of my most treasured possessions. The little stool is over 80 years old, but when I put my hand on it, I am transcended back to a time when I could stand in my grandpa’s barn. The cows were all in a row, the cats waited nearby while grandma and grandpa finished milking. I can feel my grandpa’s hand, when I touch the handle. To some it is just and old wobbly wooden stool, but to me it is a family jewel. I am so very lucky to have a treasure trove of riches like I just described. Some poor folks only have money and property that their heirs left behind. I have far greater riches. On my kitchen shelf is the butter churn my dad’s mother made butter with. I even have an old wooden butter mold she used. One turn of the crank and I am once again a small boy watching my grandma put love in everything she touched. I have an appreciation for nature and farming that was instilled in my heart. I have memories that I cherish and even some old photos. It is the little things that say I love you. My wife wears the ring my father gave my mother at their engagement. It is a small band with a very small diamond. The monetary value is low, but to me, it is priceless. It is also priceless to me, that my wife wears it next to her own wedding rings. In an old box in my shop I have my great grandpa’s rivet machine. He and I fixed pony harness many times using that old tool. I even have a few of his old rivets left to boot. Sometimes I get it out, just to look at it, to remember my grandpa and the good times we shared some 40 plus years ago. In the back of my sock drawer, is an old check box. It is not filled with receipts or old checks. It contains some old medals off my father’s FFA jacket and my mother’s apron strings. My mom gave me the box with her apron strings in it, on the day I graduated from high school. It was her way of telling me that I was grown and she was letting me go. I still cry now and then when I touch them. I feel a little sorry for the folks that only have money or thousands of acres of land, what a terrible gift that must be. I see some folks be given their grandparents farm and the first thing they do is have the trees all cut from the woods. They next split the farm into building lots. I think they must rub their hands and salivate while they wait for the money to roll in…. kind of makes me sick. I wouldn’t sell my treasures for any price. They surround me literally. I have gifts from my ancestors and a whole drawer from my children. There is a can full of coupons made by my youngest son for hugs and small chores, a couple of walking sticks from a hiking trip long ago. There are cards and photos and even and old toy or two, that gladden this man’s heart. Lastly, there are memories, I can’t imagine how you could put a price on those. They come from time spent with people doing things, picking blackberries, cutting wood, sled riding, horse wagon rides, peeling apples or just sitting nearby, explaining the ways of the world. If I was to list in a book, all the treasures in my heart, I don’t think I could do it before I run out of time on this Earth. I have whole chapters devoted just to friends, old and new. There are chapters that would contain a few bad things and bad times, but those rough spots, make the good things so much sweeter. I am so very grateful to have such a list……… Yes, I am a very rich man.